How to design a good date picker for historical data? Can you have a graphical representation of your data? The UX.SE reputation graph lets you click and drag a section of a smaller graph for it to be displayed in a larger graph. You'd need to restrict the selection on the smaller graph to be up to 30 days, but then it's very easy to select any one section within the last 5 years. First, you need to decide what a date range of zero days means. Does that mean a single day? If a single day is represented by 1, your range would be 1 to 30 days. It may seem trivial but you don't want the user to be confused. Since the range is only two years, back and forward arrows for the month should be sufficient. You wouldn't need a spinner for the year. You might want buttons for going to the first or last month. 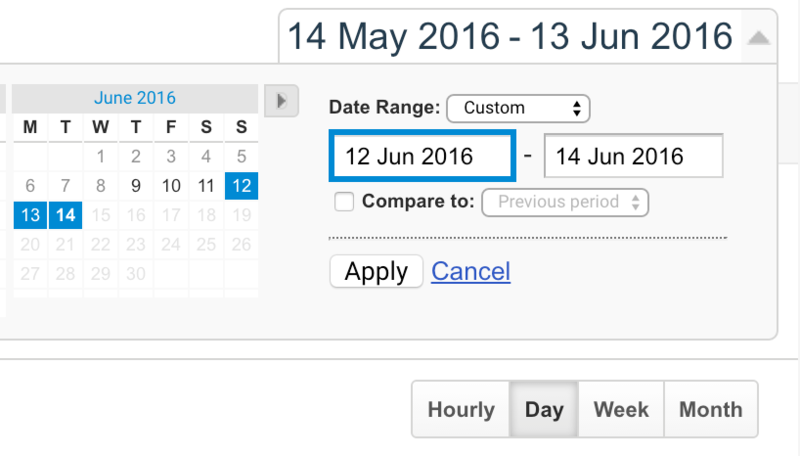 You might want a slider/range box that would show where the period of selected days is within the two year range. Moving the section of the box showing the range could open the calendar box with the months changing in correspondence with the selection on the range bar. I wouldn't want to try selecting the start date or duration from the range bar since that would be difficult for the user. Selecting one of twenty four positions (months) on the slider wouldn't be bad. Selecting one of 730 days would be awkward. Starting with these considerations, I would prototype a few versions of the picker and let the end users try them. Further details would probably depend on the nature of the rest of the application. 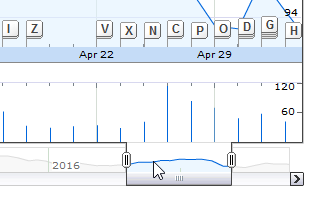 Honestly, I like how Google Analytics handles their date picker. However, you'd just need to add the drag and drop functionality and the inactive dates older than 5 days ago. Not the answer you're looking for? Browse other questions tagged datetimepicker or ask your own question. Reverting selected dates in the date-picker? Interactive calendar/date picker with sparsely selectable dates? Time zones - How to offer date filter for data linked to different time zones?